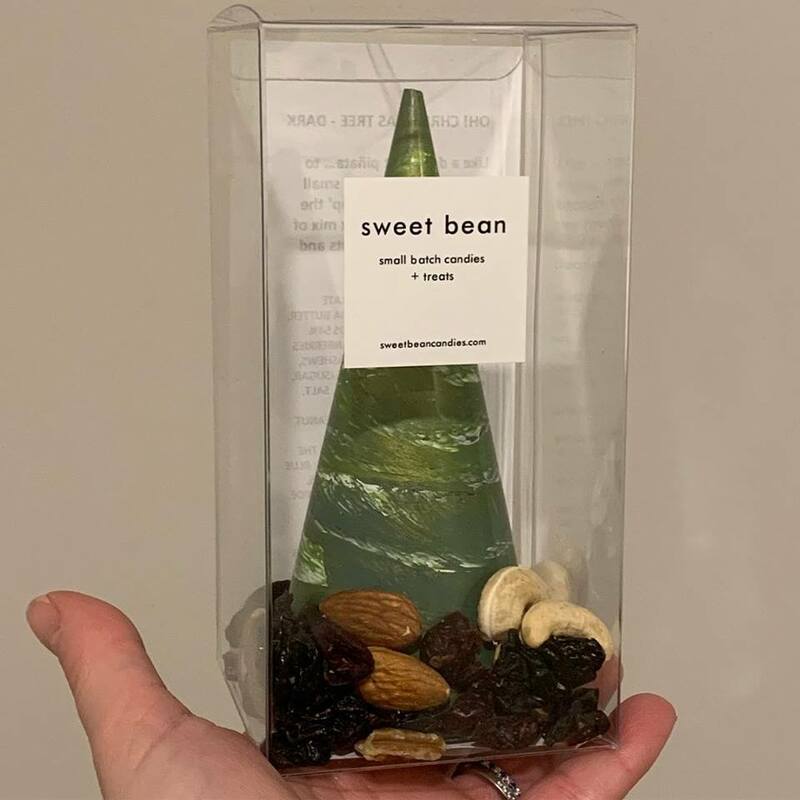 Sweet Bean is a Cleveland-based chocolate company known for their small-batch, handmade confections, focusing on handmade filled chocolates and bean to bar. We interviewed owners Kristin and Bob Barnes to learn more about their incredible local business. Sweet Bean is a small batch chocolate company owned and operated by Kristin + Bob Barnes. Currently based on Cleveland’s east side, we make sweets that we love to eat – and we hope you’ll love them too! We launched Sweet Bean in 2013 at the Cleveland Flea with our first, and signature product line: hand-painted, -filled and –moulded chocolates. Often referred to as tiny works of art – we use colored cocoa butter and a handful of painting techniques to give our bon bons their signature bright + shiny look, while scratch-made fillings created from fresh, seasonal and local ingredients (when available) make them irresistible. In 2015, we introduced our second product line – bean to bar chocolate. The first bean to bar operation in NE Ohio, we make chocolate starting from the raw cacao bean. We roast, crack and winnow the beans, then grind them (which can take multiple days) to create single origin chocolate bars. I've (Kristin) always enjoyed baking and eating sweets, and I've always enjoyed art. I studied fine arts in college, dabbling in sculpture, ceramics and painting… marrying the two together was literally the sweet spot. I enjoy the creative outlet that painting and molding the chocolates provides, creating something from scratch - and there's satisfaction when someone sees and tastes our creation as well. I think some of my favorite things to make are our seasonal offerings. Oversized painted eggs at Easter, hollow decorated chocolate Christmas trees filled with nuts + dried fruit. I love when people are almost confused that our creations are edible! We find ourselves saying “it’s chocolate” to amazed reactions a lot. So many things… a ballerina, a veterinarian, a teacher, an artist… but I don’t think anyone who knows me would be surprised that I’m making candy. For as long as I can remember candy has been dubbed my “middle name”. Over my lifetime I’ve been passionate about many things – but its the one that’s stuck with me. Chocolate is emotional – you eat it when you’re happy, you eat it when you’re sad – its therapy, its medicine… we all have a personal reference to chocolate, and I hope thru Sweet Bean I can share my passion for the ingredient. Hand-crafted chocolate molding is equal parts art and science. It’s a multi-step process, with many variables. We usually begin by determining the flavors we’ll be making, and then assigning each flavor a color palette. Everything is hand-painted, this results in each piece being truly unique. I use colored cocoa butter ‘paints’ to create the different textures you see on our chocolates. Using polycarbonate molds, I begin by painting the desired design in each cavity. I use a few different techniques, from spattering the paint, to swiping my finger across the candy molds, to layering colors using brushes (this is our signature style). Chocolate needs to be tempered, a series of heating and cooling steps while melting the chocolate to achieve the shiny, and stable consistency required to hold its shape without melting in your fingers. 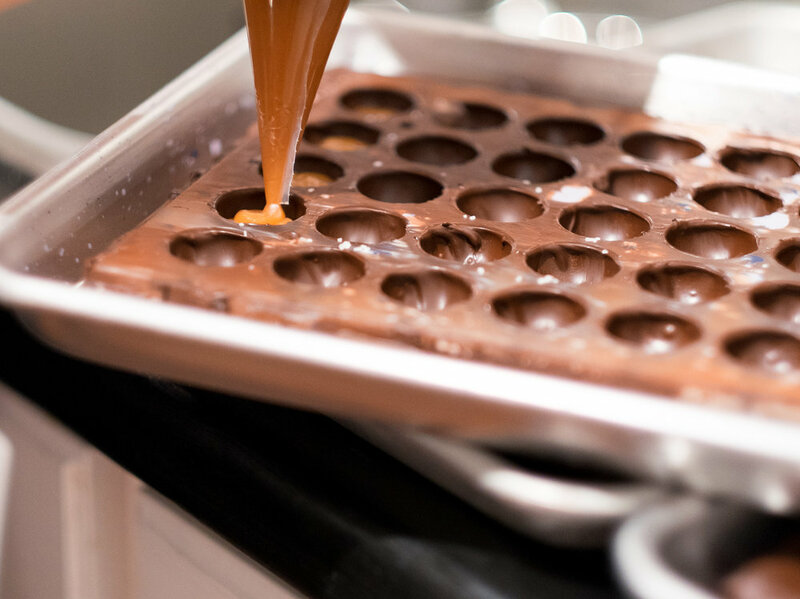 We temper by hand, and once the perfect temperature is reached – we keep the chocolate in temper while working quickly to mold and fill the candies. Chocolate making is just as disciplined. Starting with raw cacao, beans are selected, sorted then roasted, similar to coffee - paying careful attention to time and temperature to achieve the desired results and flavors. Once cooled, beans are cracked and winnowed to remove the shells – leaving behind the cocoa nibs. Nibs are then ground in a melanger (stone grinder) with cocoa butter and sugar. This process can take from 24 – 72 hours! Finally the chocolate is tempered and molded into bars, similar to the bon-bon process. Do what you love. Don’t be afraid to take a chance! Supporting local artists and makers is supporting your community. Not only are you supporting the individual/business in making a living or doing what they love, you’re fostering an environment for art and culture, for both the makers and the community at large. You’re not just making a purchase, you’re supporting dreams, and sharing someone’s passion. Making chocolates is therapeutic for me. I work full-time in a corporate setting, so I’m often making chocolates after an 8-hour day spent sitting in front of a computer. Making chocolates is my chance to daydream, and be creative… I’m always excited to see the final product once the candies are released from the molds – which end to end is a pretty quick process when it comes to art projects, so there’s instant gratification -- and it’s thrilling when I get to share our creations as well. I had to leave Ohio to really appreciate Ohio… coming back after almost a decade away from Cleveland, I had a chance to rediscover how wonderful Ohio really is. The authenticity, and resilience of the people here. The green spaces/Metroparks. The small business and creative community. The opportunities available. I love that we can travel a short distance to a nearby city/neighborhood and explore different parks w/our dogs, discover unique small businesses, and chef-owned/run restaurants. Each community truly has its own flavor.